Is LeBron James Already Out In This Year, MVP Race? Cleveland Cavaliers superstar and perhaps still the greatest player in the planet LeBron James was once again a top candidate for this year KIA MVP Race and as the 2016 – 2017 NBA Season near its end, the King has been averaging a career best in points, rebounds, assists, 3 point percentage and field goal percentages since in his return back to Cleveland 3 years ago. This season, LeBron James has been averaging 26 points, 8.4 rebounds, 8.8 assists and shooting 54 % in a field goal, the only downside for James this season is his free throw percentage of 67 % also his worst in his NBA Career. Despite having his best year this season James chance of winning his 5th NBA MVP is slowly fading away due to recent struggles of his team Cleveland Cavaliers and worst they are beating very badly in their losses and lately a back to back blown out loss to a dangerous playoff contender in the East the Washington Wizards and to a potential Finals match in the West against the San Antonio Spurs. The CAVS who holds the 1st place in the Eastern Standings for almost the entire season falls down to 2nd place after the Boston Celtics. 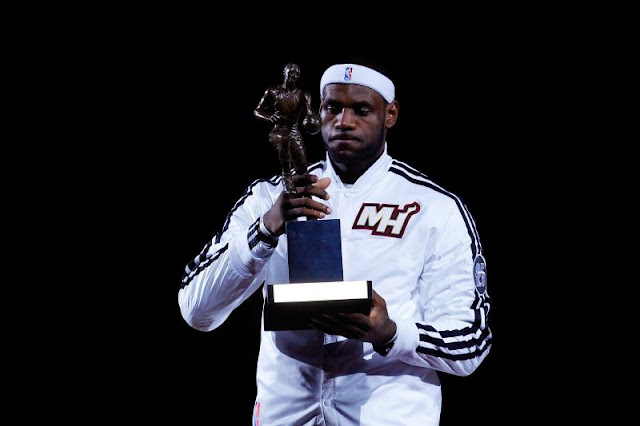 Now, LeBron James is obviously having his great season when it comes to individual statistics, returning from his MVP caliber since the last time he won the MVP award as a Miami Heat, but James also has a legitimate contender for the MVP award and those two contenders are the favorite to win the award? Oklahoma City Thunder point guard Russell Westbrook has been awesome for his team averaging triple doubles per game this season and James Harden of the Houston Rockets elevating his team to the next level and also having a great season and there is also Kawhi Leonard of the Spurs who is also having a great season. Chances for LeBron James to win his 5th MVP are not good as of now, media and sports analyst are not mentioning James name to win his 5th MVP despite every season James has always been there in the list of KIA MVP Race but it looks like the media and some NBA Sports Analyst only see two NBA Superstar fighting for the award Westbrook vs Harden for the MVP Award this year? What do you think guys were LeBron James already out of the MVP contention or he has a legitimate chance of winning his 5th MVP? No Comment to " Is LeBron James Already Out In This Year, MVP Race? "